This article continues an ongoing series on the theology of the various Good Friday rites, covering that of the Novus Ordo. I have decided to break it into two parts, this one on the ceremonial aspects of the rite; the next part will discuss the textual changes. The previous articles discussed the rites in the Missal of St Pius V, and the revised Holy Week of Pius XII; I would suggest reading at least the latter before reading this one. In a few important respects, the Good Friday ceremony of the post-Conciliar Missal returns to the historical practice of the Church, and corrects some of the serious problems of the 1955 “Solemn Liturgical Action”, while getting rid of its clumsy title as well. 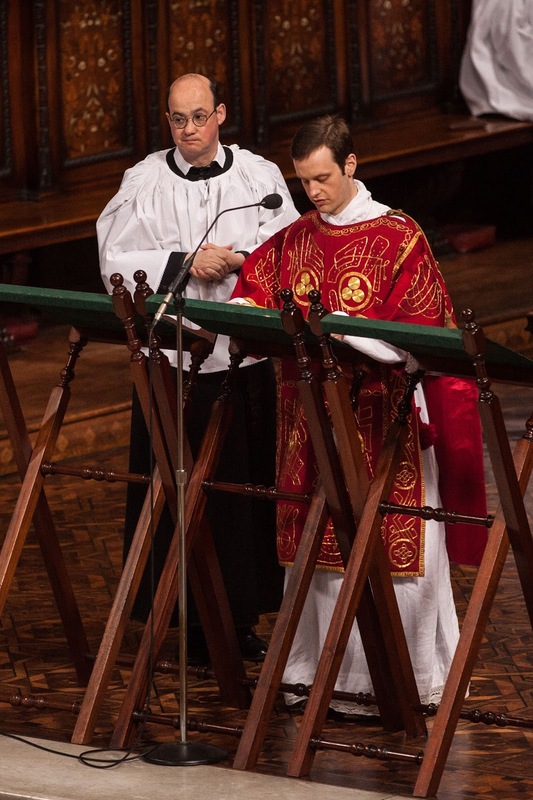 The celebrant wears a chasuble for the whole ceremony, restoring an important sign of the link between the Mass and the Death of Christ on the Cross; the rubrics make this connection explicit by prescribing that the priest and deacon be dressed “as if for Mass.” (sicut ad Missam induti) The three complete changes of vestments introduced in the 1955 reform are removed, to everyone’s relief. Several of the ritual peculiarities that separate the Solemn Liturgical Action from the rite of Mass are removed. The first two readings are said in the usual manner of the 1969 Mass. The solemn prayers are said from the same place that the general intercessions are usually said. 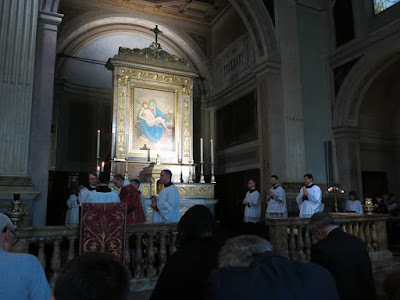 At the end of the rite, the prayers have returned to an order which is the same as that of the Mass, with a single Postcommunion and blessing of the people. Some of the new practices of the Pius XII reform which separate the rite from that of the Mass have been retained, most notably, beginning the ceremony with the altar completely bare of cross, candles and cloths. These all find their way to the altar as they do in the 1955 rite, and the fundamental arrangement of the ceremony remains the same as well: the readings, the solemn prayers, the adoration of the Cross, very much reduced in solemnity, and the distribution of Communion, without the Mass of the Presanctified. The Cross may be brought into the church from the sacristy, as in 1955, and unveiled in three stages, as in both 1955 and 1570. 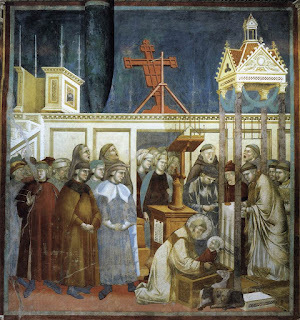 A second option is also provided, that it be carried in from the door, and raised at the words “Behold the wood of the Cross…” at three stations, the door, the middle of the nave, and before the sanctuary. In this latter case, the Cross is not veiled and uncovered in three stages, an entirely pointless innovation. In either case, the rite may be also be done by the deacon or “another suitable minister”; the “suitability” of the latter is not defined, and no specific circumstances given when this may be done. It is therefore always licit (but never required) for the Cross to be presented to the faithful by someone other than the celebrant of Mass, diminishing the priestly nature of the rite. The adoration of the Cross itself is done in the simplified manner of the 1955 ritual, by a simple genuflexion “or another appropriate sign according to local use, e.g. by kissing it.” Of course, one might just as well decide that the “local use” be the one that all localities were using before the 1955 reform, namely, a triple genuflexion, kiss, and single genuflexion before moving away. 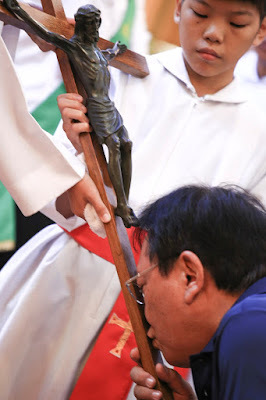 One of the very worst features of the 1955 reform, by which it is permitted to merely hold up the Cross for the faithful to see and briefly adore at a distance, without coming forward to kiss it, is somewhat improved in 1970. The 1955 version foresaw this if the congregation were too large, and only for them; the new version says that at least “part of the clergy and the faithful” (my emphasis) do the adoration first. Again, we can only hope that no one has ever actually put this deplorable idea into practice. The Communion rite is fundamentally identical to that of the 1955 reform; as noted above, the conclusion of the ceremony is the same as that of an ordinary Mass of the new rite. There are a number of textual changes to the very ancient readings, chants and prayers of the ceremony; I will discuss these in a separate post. They are not insignificant, but strange as it may seem to say, the most important theological change is the abandonment of black vestments in favor of red. The reading of the Gospel in the Ambrosian Rite Good Friday ceremony. However, the post-Conciliar reformers had very little interest in the medieval Uses, and if they had a specific source in mind for changing the vestments on Good Friday to red, it was almost certainly the Ambrosian Rite. None of the many things putatively borrowed from other rites came into the Novus Ordo in their integrity, i.e. as they were actually done or said; at Milan, from very ancient times, red was a color of mourning, and thus used for the whole of Holy Week, including Palm Sunday and Holy Thursday. (Marco Navoni, Dizionario di Liturgia Ambrosiana.) No suggestion seems to have been made to borrow the Ambrosian custom of using black on the ferias of Lent, even though this is also attested by Durandus for the Roman Rite. It should hardly need saying, therefore, that the change from black to red must be understood within the context of the Roman Rite as it was when the change took place, and not in reference to any putative source, or putative return to an earlier custom. Why then is it important? The liturgical celebration of the events of Our Lord’s life is not a series of commemorations of events in the dead past. We live though these events as things for which we are really present, and in which we really participate. In Advent, we repeatedly invite Him to come to us; we do not thank Him for having come 2000 years ago. The first Invitatory of the season is “Come, let us worship the King who is to come”, not “the King who was going to come.” At Christmas, we sing “For unto us a Child is born”, not “was born”; at Epiphany, “Behold, the Lord has come to rule.” At Easter, we join our Byzantine brethren in saying “Christ is risen”, not “Christ rose.” (This last is particularly significant because in the original Greek, the verb “anesti” is an aorist, and should technically be translated as “rose”; nevertheless, in all languages that distinguish between the perfect tense and the simple past, it has been received as “Christ is risen”, and rightly so.) Dozens more examples might be adduced to the point. St Francis Institutes the Manger Scene at Greccio (from which derives the English word “creche”), painted by Giotto in the upper basilica of St Francis at Assisi, 1297-1300. The living representation of Christ’s Birth in expressed in the fact that what St Francis holds is clearly the Child Himself, and not just a doll. It is surely not a coincidence that this understanding of the Christian liturgical year is so strongly present in the writings of a Church Father who is particularly important as a Doctor of the Incarnation, Pope St Leo the Great (444-61). In his sermons, he loves to begin with a reminder that the mystery of the day is something which should always be present to us, but is especially so on the feast itself. A classic example of this idea may be found in one of his sermons on the Passion. This may very rightly be seen as a development from the central rite which the liturgical year enshrines, the celebration of the Eucharist, and the historical understanding of it; at every Mass, the Sacrifice of the Cross is not remembered as a thing past, but honored as a thing present. With this idea of the liturgy as the living representation of the events of Christ’s life, Good Friday is not simply a day to remember His Passion, but to mourn over it as if we ourselves were present for it, no less than His Mother and St John. It was therefore quite natural that the Roman church’s liturgical color scheme should evolve in such a way as to restrict black to Good Friday and the other principal occasion of mourning, the Requiem Mass. As I explained in the first article in this series, this is very much the animating spirit behind all the rites of the historical Good Friday ceremony. The “communion” which we receive on that day is the kissing of the Cross; the Mass of the Presanctified imitates the rite of Mass to express the union of the first Mass, the Lord’s Supper, with the Sacrifice of the Cross, and therefore of every Mass with the Sacrifice of the Cross. At a normal Mass, the Fraction rite, the reunion of Christ’s Body with the Blood shed for our redemption, represents the Resurrection; on Good Friday, the Resurrection is not made manifest, because the Body is broken, but not reunited with the Blood. All of this is very much attenuated in 1955 by the simplification of the adoration of the Cross, the elimination of the Mass of the Presanctified, and the restoration of Eucharistic communion to the faithful. This attenuation carries over into the Missal of 1970, and is exacerbated by the removal of black vestments, the vestments of mourning which are worn when a dead body is present. While violet for the day would have been less in keeping with the historical tradition, in the context of the modern rite, it would have been a far more appropriate choice, as the normal color for a funeral. The use of a color principally associated with the deaths of the Apostles and Martyrs does not emphasize the fact that Christ shed His blood for us on Good Friday, but rather deemphasizes what makes the shedding of it unique and uniquely important.